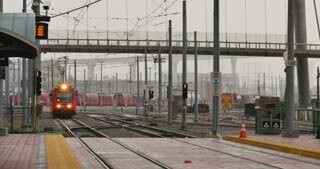 SAN DIEGO, CA - Circa February, 2017 - A daytime establishing shot of the 5th Avenue Station of the San Diego Metropolitan Transit System train. SAN DIEGO, CA - Circa February, 2017 - An overcast daytime establishing shot of the entrance to the Gaslamp Quarter in San Diego. 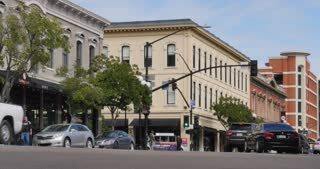 SAN DIEGO, CA - Circa February, 2017 - A daytime slow motion establishing shot of the Old Town flag blowing in the breeze. 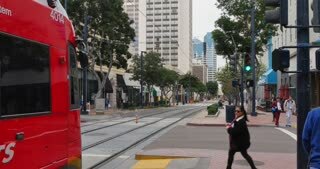 SAN DIEGO, CA - Circa February, 2017 - A subway train from the San Diego Metropolitan Transit System passes along C Street in downtown. 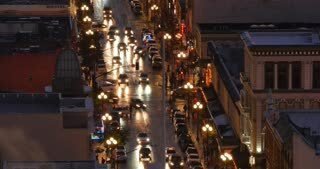 SAN DIEGO, CA - Circa February, 2017 - A timelapse evening long shot view of traffic passing on 5th Avenue in San Diego's Gaslamp Quarter. SAN DIEGO, CA - Circa February, 2017 - A low angle daytime establishing shot of traffic in San Diego's Gaslamp Quarter. 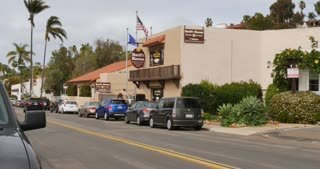 SAN DIEGO, CA - Circa February, 2017 - A daytime establishing shot of traffic and businesses in Old Town San Diego. 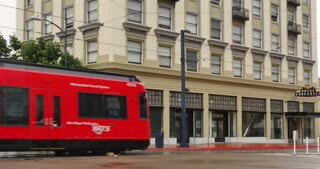 SAN DIEGO, CA - Circa February, 2017 - A subway car from the San Diego Metropolitan Transit System passes the Hotel Churchill building on C Street. 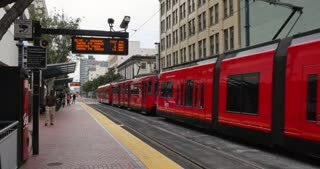 SAN DIEGO, CA - Circa February, 2017 - A daytime establishing shot of a San Diego Metropolitan Transit System train car approaching the Gaslamp Quarter Station. 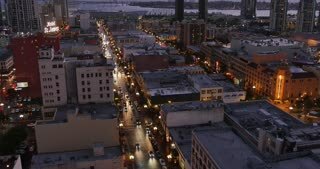 SAN DIEGO, CA - Circa February, 2017 - A timelapse evening view of traffic passing on 5th Avenue in San Diego's Gaslamp Quarter. 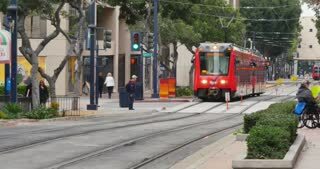 SAN DIEGO, CA - Circa February, 2017 - A daytime establishing shot of a train departing the 5th Avenue Station of the San Diego Metropolitan Transit System. 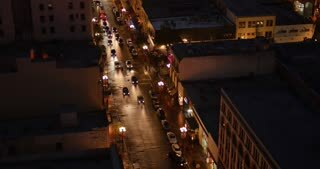 SAN DIEGO, CA - Circa February, 2017 - An aerial evening long shot view of traffic passing on 5th Avenue in San Diego's Gaslamp Quarter.